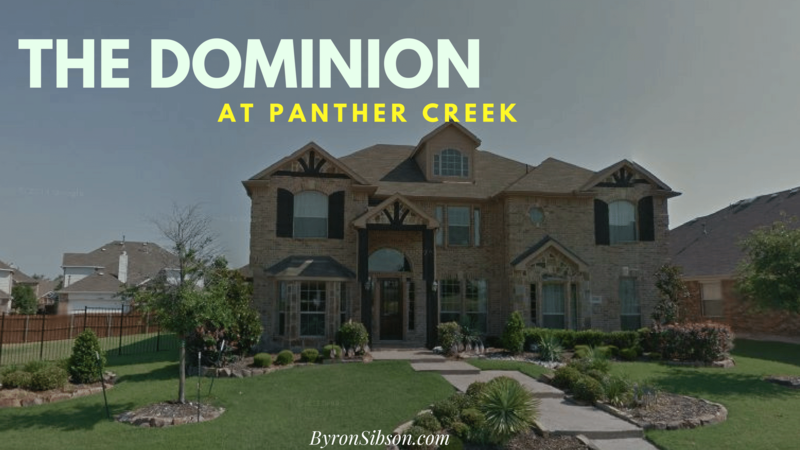 Dominion at Panther Creek is a 5-star neighborhood in Frisco Texas. Located between Hillcrest and Preston on Eldorado, The Dominion encompasses parks, hiking and biking trails, community centers and of course, part of the most coveted school district in Texas, the Frisco ISD. Although it’s not gated, the Dominion has some of the most prestigious addresses in the city. Gorgeous two-story brick homes, lush, manicured landscaping, and an amenity center with a swimming pool, parks, and trails. Most of the homes were built between 2004 and 2008 and feature large layouts of up to 4500 ft.², 3 to 6 bedrooms, 4 to 5 bathrooms, and prices from $350,000-$550,000. Homeowners dues are roughly $50 per month and cover common area maintenance, management and full use of facilities and common areas. Most homes feature two or three car garages with larger lots of up to 9000 ft.². Of course, the Dominion is in one of the most coveted school districts, the Frisco Independent School District and the Dominion is served by the Tadlock Elementary school, the Maus middle school, and the Heritage high school. These schools receive excellent scores for academics, test scores, and extracurricular activities. Shops, restaurants, markets and more are about 5 to 10 minutes from this location.